“If a piece of equipment purchased in the 1920s is kept up and can guarantee, at present, an operable rate close to 100 percent and if it can bear the production burden placed on it, the machine's value has not declined a bit. On the other hand, if a machine purchased last year has been poorly maintained and produces at only half its operable rate, we should regard its value as having declined 50 percent." The same could be said for buildings. Even according to UND's own figures in its Master Plan, it destroyed over $12 million of value when it destroyed the buildings of Wesley College. This is calculated by subtracting deferred maintenance from the buildings' current replacement value. The estimates made by the ISES Corporation, upon which UND's Master Plan is based, systematically overestimated replacement costs (such as unnecessary carpet) and systematically underestimated these buildings' value, completely ignoring the cultural value of their terrazzo floors, the acoustic properties and illustrious musical history of Corwin Hall's concert hall, the mosaic floors of Sayre Hall, and the gorgeous view from their south facing windows. These were buildings that other cities wished they could have had, buildings that President Merrifield had assiduously worked to bring to UND rather than somewhere else – and now they are gone, destroyed by university administrators who seem to have an “easy come, easy go” attitude toward buildings. Yet, UND administrators are far from alone in this culture of waste. This appears to be a statewide pattern. For example, during this century, Mayville State University has lost East Hall, West Hall, and its Old Gymnasium. Although the University of North Dakota was founded in 1883, how would one know that by looking at UND's architecture? There is a deep irony in this, given how architecture was originally intended as a central – if not the central – part of UND's curriculum, given that the University of North Dakota was originally founded in a Freemasonic ceremony. State legislators need to ask why our state universities are destroying buildings that are important not merely for their historic value but especially for future prospects for tourism. They need to ask why tens of millions of dollars worth of value are getting wantonly destroyed and why university administrators are showing contempt toward our state's future economic prospects by wrecking the possibility of future tourism centered on university architecture. They need to ask why North Dakota's university administrators are so ignorant of the Toyota Production System. We have university administrators who keep talking about “economic development”, yet are unwilling to sell architectural treasures to developers or give them to local nonprofit corporations, preferring instead to destroy North Dakota's heritage. We have university administrators who keep talking about “the needs of twenty-first century students” yet fail to see how real twenty-first century students have already seen the future of higher education – and it's called Hogwarts. Few things help promote a university's future than legacy buildings with a “Hogwarts Vibe”. The reason why this destruction happens is because North Dakota's higher education is ruled by an inferiority complex a mile wide. Symptoms include destroying a region's architectural heritage while obliterating its indigenous culture and particularly its indigenous languages, often to the extent of positively celebrating cultural ignorance. Australians call this inferiority complex the cultural cringe. The cultural cringe is a force nullifier. Once a cultural cringe afflicts educational leadership, the positive effects of an administrator's training, credentials, and experience become effectively disabled. If one imagines that the commencement of destruction against Corwin Hall was the worst event for UND on May 23, 2018, one would actually be wrong. On May 23, UND formally rejected its historic mission to serve the State of North Dakota, preferring instead to serve the community of Grand Forks and only the community of Grand Forks. Its Master Plan criticizes UND's buildings as “tired and shabby”, never mind that UND's buildings are quite young in comparison to Cambridge, Oxford, Princeton, Bologna, and the Vatican. Rather, UND's Master Plan glows in praise for the University of Central Florida, which as been called the “University of the Future” by the Orlando Sentinel. The University of Central Florida can get away with calling itself “Orlando's Hometown University” because Orlando is a major hub for tourism. Grand Forks is not Orlando. Grand Forks isn't even Memphis, with its hub for Federal Express. Minot is well on its way to overtaking Grand Forks to become the third biggest city in North Dakota. Grand Forks is anything but crazy rich like Shenzhen or Singapore. Starting in 1975, McCoy Air Force Base was transformed into Orlando International Airport. Grand Forks is unlikely to ever become as big as Orlando precisely because Grand Forks clings for dear life to the Grand Forks Air Force Base. Although keeping Grand Forks Air Force Base comes with a hefty opportunity cost of losing a first class civilian international airport, such a civilian airport could only pay for itself if Grand Forks becomes considerably less stagnant than it has been since the Flood of 1997. Grand Forks has nowhere near the political clout it once had during the nineteenth and twentieth centuries. It would be a delusion to regard a city that gets its newspapers printed in Fargo to be anything other than a satellite of Fargo. So, when the University of North Dakota firmly rejects the views of alumni from outside of Grand Forks, UND hitches itself to a fading star. Once a university's leadership promotes an “echo chamber” with a “community working together in lock step” as a good thing, that leadership shows it is impervious to reason. One might think that NDSU could be a flagship university, but one would be wrong. NDSU is focused on itself. NDSU has three bases of legitimacy. The first is to function as Fargo's local college, which makes sense given Fargo's status as North Dakota's biggest city. The second is to function as a land grant college serving agriculture, and the state economy in general. The third is most important – to rival UND. Starting with the tenure of President Coulter, NDSU served as the Non Partisan League's clubhouse in opposition to UND's reactionary politics. This function became symbolized by a collectivist nickname par excellence – the Bison, chosen expressly to step on the Flickertails of UND. This rivalry is so central NDSU's identity that NDSU becomes oblivious to the reality of the rest of North Dakota – it fails to see how this wasteful rivalry irritates people throughout the state. UND and NDSU act like a classic “dog in the manger” toward each other, each keeping the other from living up to its historic mission. NDSU's pharmacy program belongs at the state medical school. NDSU's architecture and architectural history programs belong at UND. Meanwhile, UND's business school – minus Economics and Political Science, which belong in Arts and Sciences – belongs at NDSU. Meanwhile, the “North Dakota University System” office has become yet another layer of bureaucracy that has failed to stop administrative rivalry one bit. If the system office had systematically cut administrative ranks, there might be some justification for its continued existence, but that has not happened in decades and it is very unlikely to happen under anything like its present leadership. 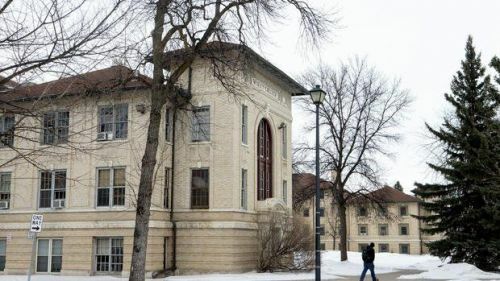 It looks as though the only way for the Legislature to stop this mania in North Dakota's higher education for planned obsolescence would be to establish a moratorium for state funding of new buildings for the next thirty years. Our universities need to learn the institutional habit of taking good care of existing buildings. In North Dakota's cities, there is plenty of available space in shopping malls and abandoned big box stores. There is no need to build any more monuments to the resumes of university administrators, or their egos. Higher education is suffocating under the weight of wasteful bureaucracy that siphons public goodwill. The Augean Stables must be cleaned out. All administrative ranks between dean and commissioner need to be eliminated. This includes every vice chancellor, ever president, and every vice president – a clean sweep. Each dean should become a statewide office heading a statewide college that functions as a statewide institution. The Legislature should start with establishing a statewide Dean of Education, a statewide Dean of Nursing, a statewide Dean of Law, and a statewide Dean of Medicine. Once these statewide colleges are established in the first two years, other colleges should follow suit. Each statewide dean should report directly to the commissioner. Lest deans imagine that they can create their own feudal empires, the number of assistant deans or associate deans available to them should be strictly dependent on student numbers. Most importantly, North Dakota's colleges and universities need leadership that is accountable to the electorate. We need to change our state constitution to replace the presently appointed Board of Higher Education with an elected Commissioner of Higher Education, with a salary equal to the elected Superintendent of Public Instruction. Hopefully, the Legislature can put this amendment to the voters. If that does not happen, the route of an initiated measure should be used instead.